Cliffs, Carnival and Clive – Run. Ride. Roam. Well, England my love, me darlin’, the grand dame that you are, you did it! You delivered! You are a star! We were presented with another bonza day, with the sun shining all day, t-shirt weather and just a warm, gorgeous summer’s day. Thank you, thank you! What a perfect day for a walk along the cliff tops, before descending the long slope into the town of Hastings to investigate the Old Town Carnival. After a leisurely breakfast, that’s how we started the day, strolling down the road from the campsite, onto the wide, open space of the cliff top and then down into the town. 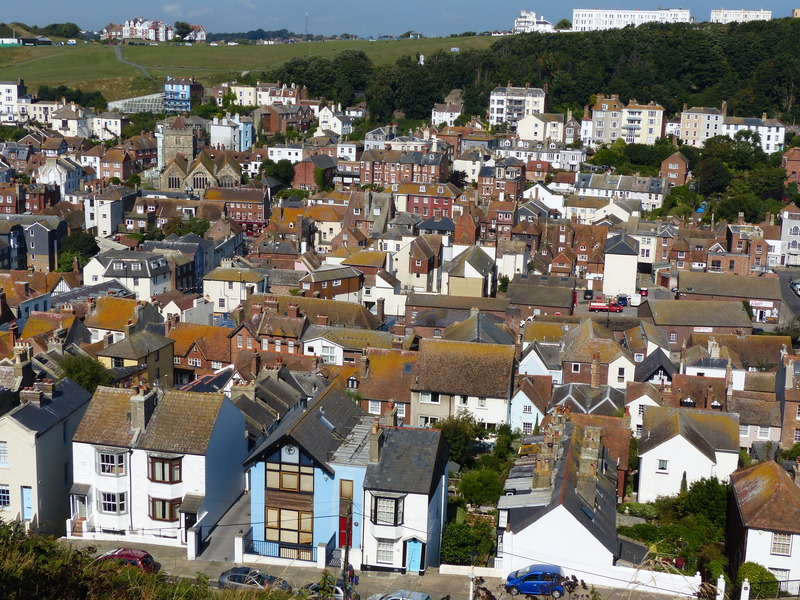 We had a super view across the town from the top and if there’s an urban townscape that’s pleasant on the eye, Hastings from above was it. 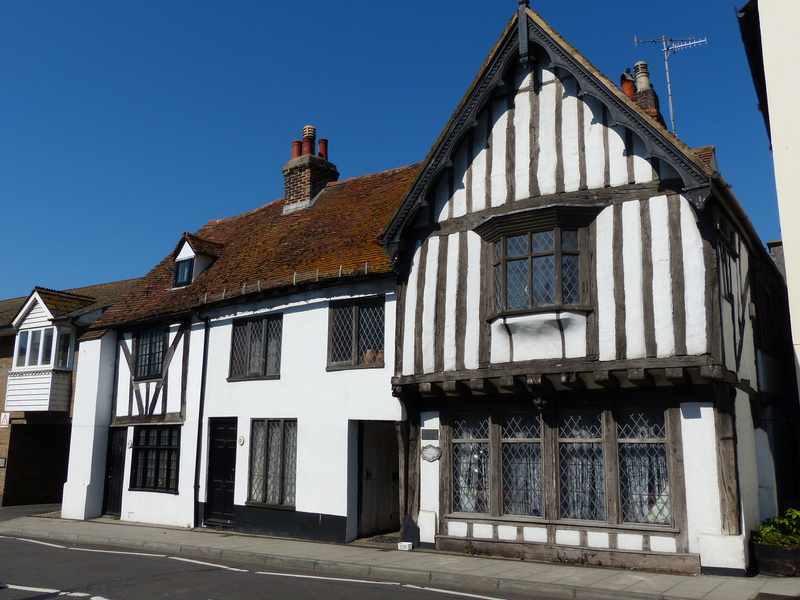 The houses were beautifully period, a mix of colours and nothing too modern to jar the eye, in this historic town. Heading to the Old Town was our first roaming decision, since it’s these areas we love to explore. 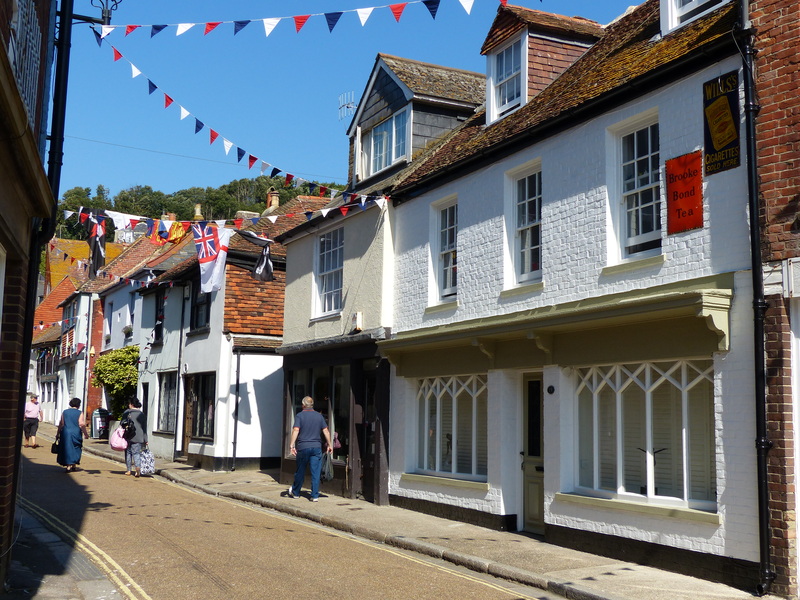 We strolled the back streets and found beautiful old houses, narrow streets with old buildings, historic shopfronts and flags and bunting to get into the carnival spirit. It was delightful, walking these old streets in the sunshine and seeing lane ways and houses that looked so unspoiled and unchanged for the decades in which they have stood. 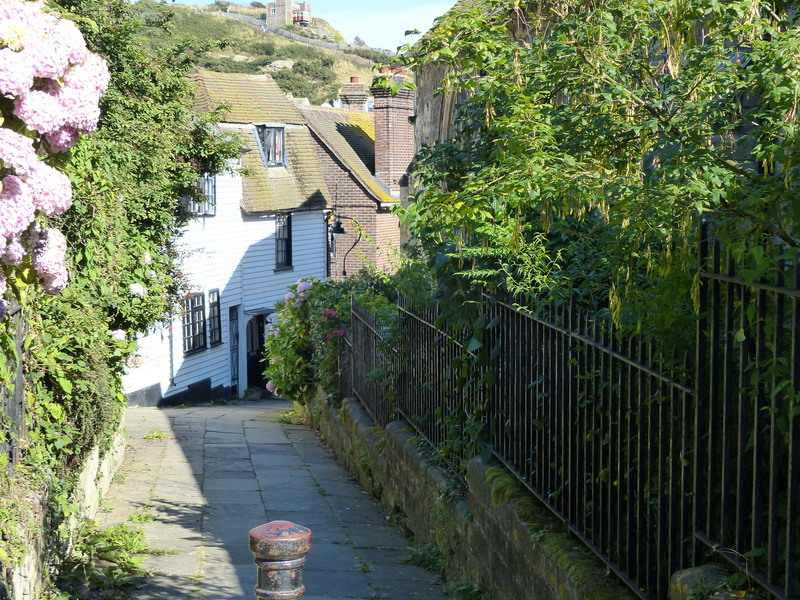 Like Eastbourne, it seemed Hastings had its gems hidden away in the back streets. 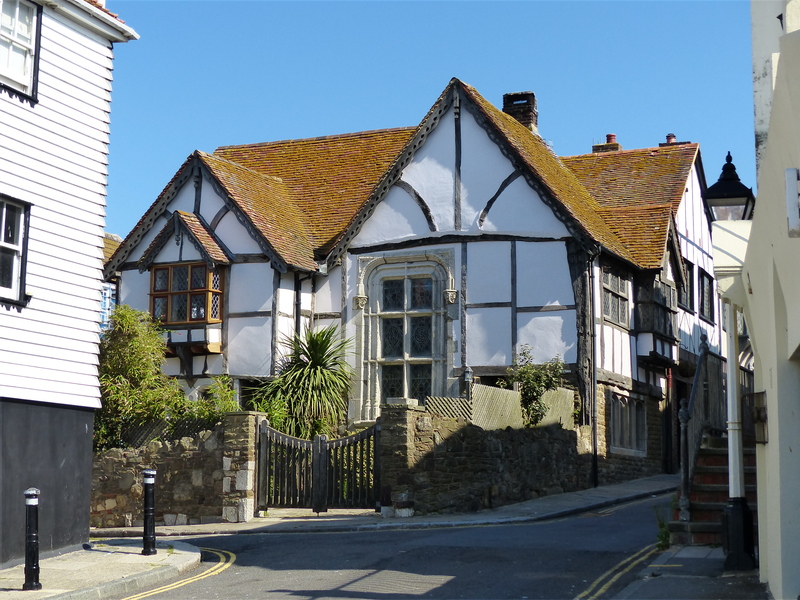 The seafront was full of arcades, loud music, tourist shops and the usual seaside attractions, but the back streets served up some gorgeous, peaceful, quiet little gems of gorgeous buildings and postcard streets. 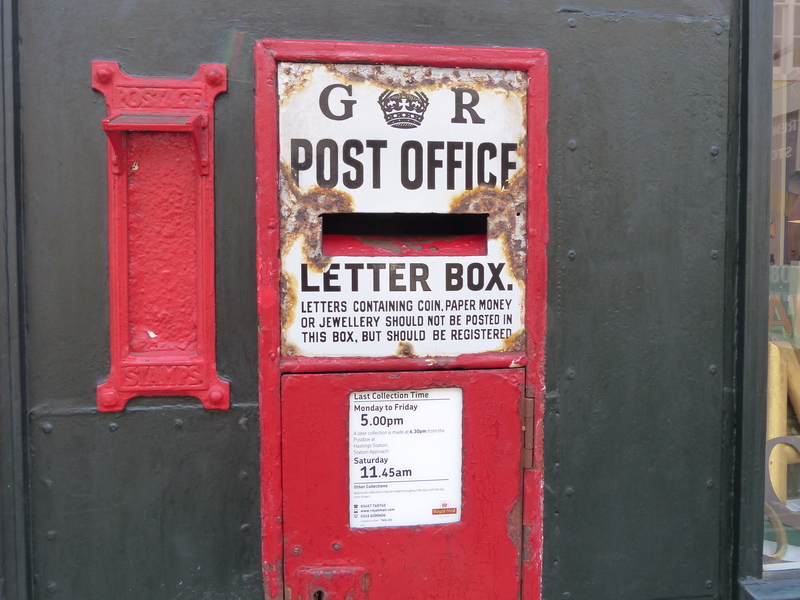 The letters give an indication of the age of this postbox. Not E R for Elizabeth Regina, but G R for King George Regina. We strolled past Judges Bakery, which has been operating in the town since 1826, making it one of England’s oldest working bakeries. They make organic and artisan breads, pastries and other bakery delights, so this seemed as good a place as any to stop for elevenses. The bakery had a lovely, quaint little tea room at the back, so we took a seat and Steve enjoyed his ginger beer and brownie and I had some fabulous granary toast and homemade jam and we were now set for our onward strolling. 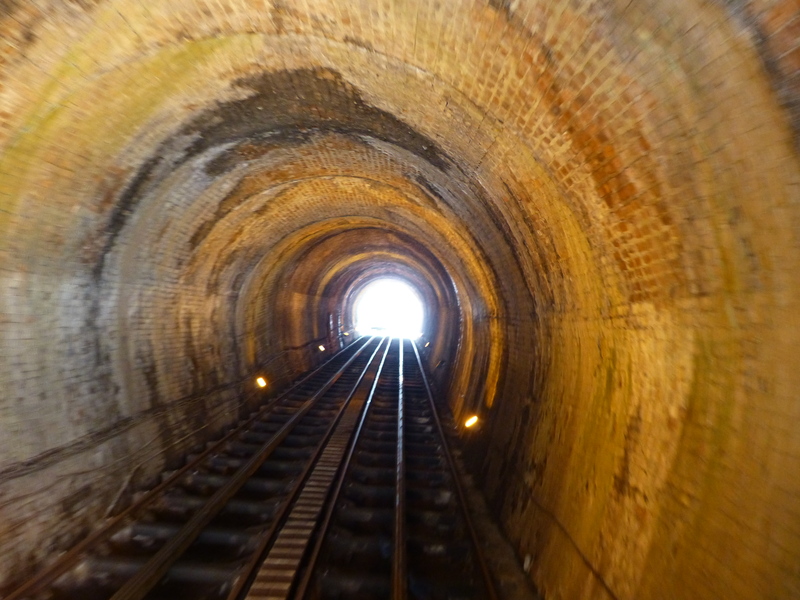 Hastings also has one of England’s steepest funicular railways, so we set off to take a ride up the hill to yet another cliff top. The little train chugged and clunked its way up the cliff and delivered us to the magnificent view overlooking the seafront and with the wide expanse of ocean before us. 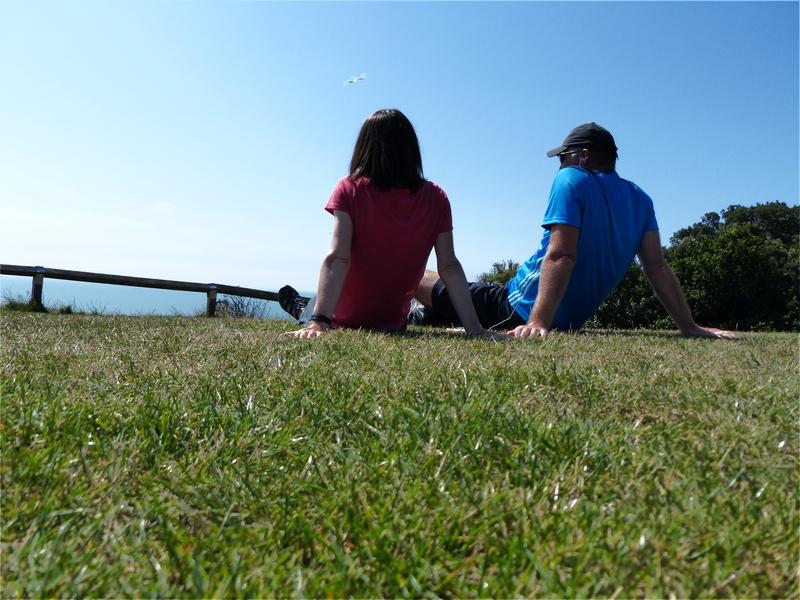 There was an old castle up there too, but we decided again, not to pay the rather exorbitant entry fee and instead enjoyed a sit in the sunshine, looking out to sea. It was lovely, just sitting, like so many of the locals do – sitting and enjoying the warmth and the view. After a stroll along the cliff edge, we took the little railway back down and continued our strolling and wandering around the town. The town was bursting at the seams, being the second last day of Carnival Week, combined with a weekend and splendid weather. The crowds were building and once again, every second person seemed to be inhaling ice-cream in some form. In fact, catching snippets of conversation as we strolled along, it seemed the words “ice-cream” were a regular topic of conversation. So it seemed, if people weren’t eating it, they were on their way to buy it or talking about it or using it as a means of persuasion! It sure is a popular food over here. After much roaming and strolling amongst the crowds and through the charming streets, we had reached lunch time. We had planned to have lunch at a very English establishment and partake of some very English fare. Pie and mash. Perfect! We headed to Foyle’s Pie and Mash Shop, which was a forties era style eatery that served nothing but pie and mash, so no great decisions to make from the menu. What was fantastic about this place was, they had both a vegetarian option and a vegan option too, as well as the regular meat pies. How great! 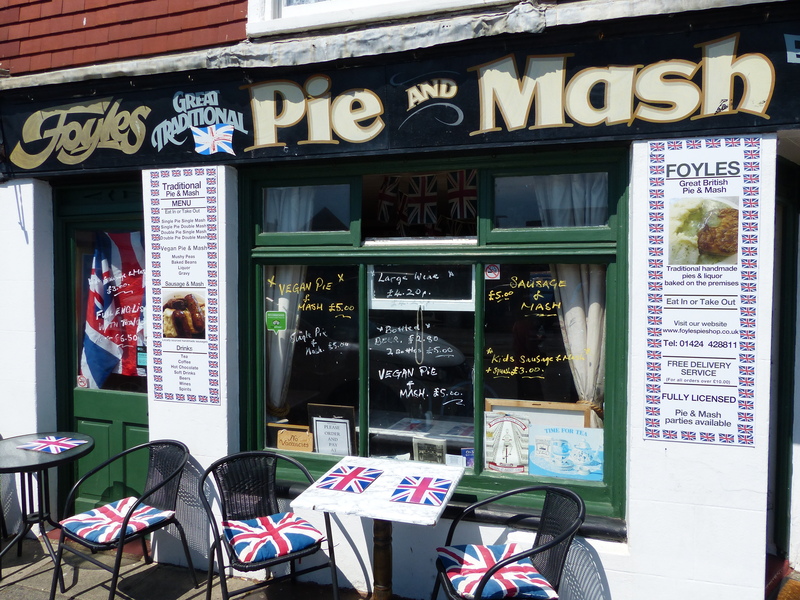 Steve had a steak and ale pie, mash and gravy. 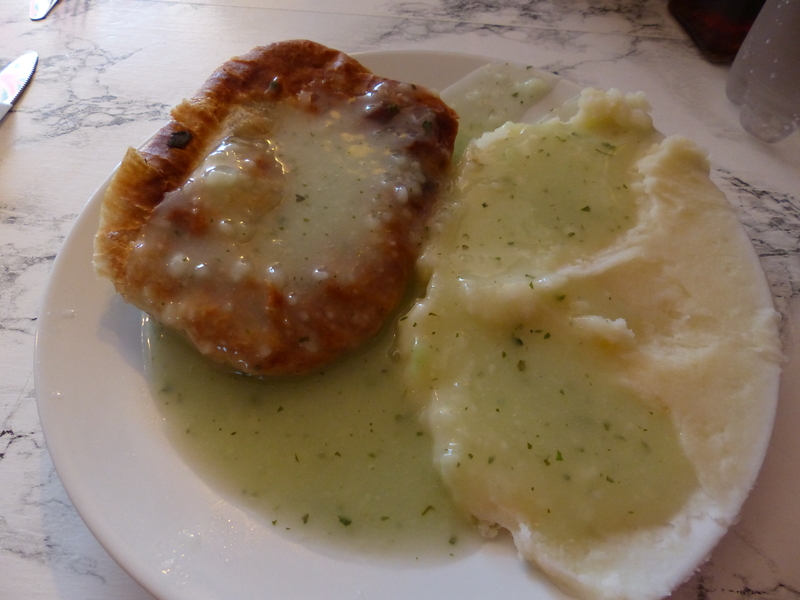 I had the vegan pie and mash and traditional liquor, which was a parsley sauce. It was delicious, superb, spot on, scrumptious and splendid. Simple food done well. I was really impressed with this little place, especially when there was the choice of gravy or liquor with the pie and when I asked if the gravy was vegan, the lady said, “It’s vegetarian, but not vegan.” I thought it was great that they not only offered both options on the menu – vegetarian and vegan, but that they knew enough to know the difference between these, when asked about something on the menu. A top little place. We were filled up with good, hearty, stomach lining grub, so we continued our roaming through the streets of the Old Town. We could hear toe-tapping music flowing down the street and soon came across a group of dancers putting on a demonstration of jitterbug. They were amazing. The men were especially great, with their legs flicking this way and that, twirling and kicking and I stood and watched with a big grin on my face. I clapped my hands until my palms were pink, in appreciation of their talents. 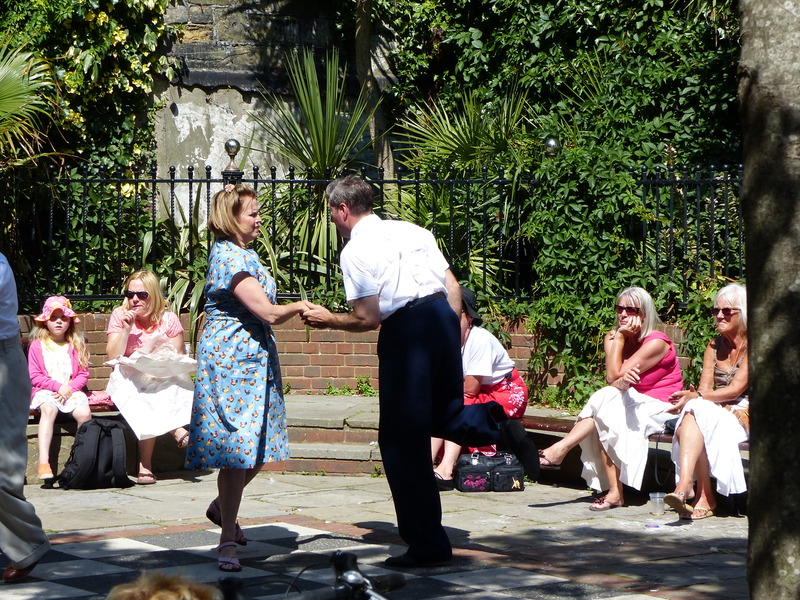 It was such fun to watch, they were dressed in period forties clothes and they jitterbugged to that forties music, with such enthusiasm, it was brilliant. It was almost time for us to make our way to the meeting point for our Foyle’s Walk tour of the filming locations from the TV series Foyle’s War. We decided to have a little sit, before heading off on the walk, so we pushed the boat out today and after having elevenses and lunch, we decided on afternoon tea in a tea room as well! 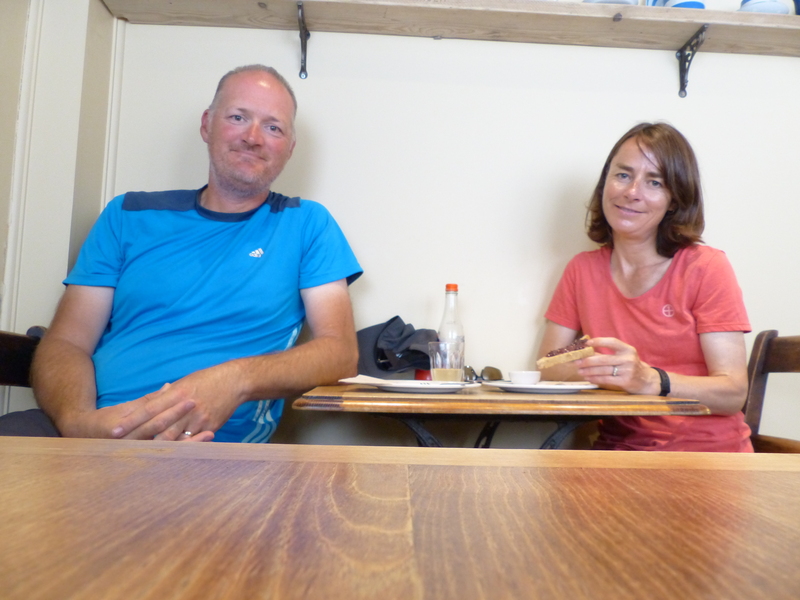 We found a lovely little tea room in the Old Town, where I had a pot of tea and crumpets and Steve enjoyed a cold drink with his slice of lemon drizzle cake, and we once again had full bellies and we were ready to roam. Our tour guide for the Foyle’s Walk was the lovely Clive. Clive wore a monochromatic ensemble of beige and his windswept grey hair, enjoyed airing itself this way and that on the sea breeze. He gathered our small group around him and began telling us about the days when the series was filmed in Hastings. He had his reference books with him, which he referred to often and held up pages from the small book, for us to squint at from a distance, to see the photos he was showing us of various cast members at locations around the town. Clive was a gem. He had the sort of voice that would work beautifully as a lullaby and I mean that in the nicest possible way. That’s merely a description, not a judgement, he just had that very slow, deliberate way of speaking that was almost a verbal monochromatic tone to match his beige ensemble. He took us to the beach and showed us the boats, some of which were used in the series. He told us about living in the street behind where a lot of the filming was done. In fact he told us a lot of details. Clive liked details. We probably learnt as much about the tiny details of filming as we did about any particular sites or locations. If there was ever a Mastermind special subject on the behind the scenes and ins and outs of filming Foyle’s War, Clive was the man to own it! 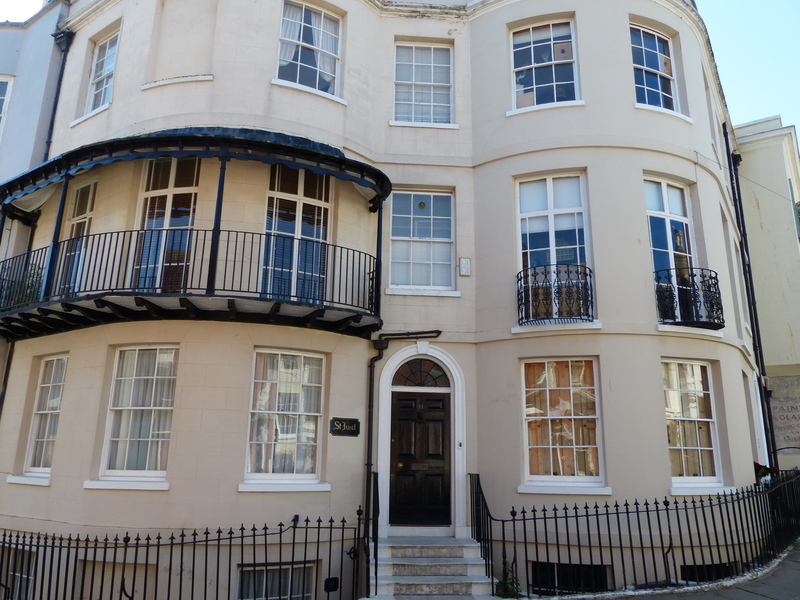 We did see some of the streets that were regular locations in the series and we also saw the house that was used as Foyle’s house in the series. It was a fun little tour to do, with Clive the charming guide, who clearly loved his subject. It was a terrific way to end the day. Now when Steve and I see repeats of Foyle’s War, it will be another occasion where we can look at the screen and say, “Been there! Seen that!” Thanks to Clive. After elbowing our way through the now jam packed crowds, to pick up some very meagre supplies for supper, since we had eaten more than our fill for the day, we began the trek back up the steps and slope of the cliff, along the open space of the Country Park, back to the campsite. It was a lovely walk in the sun. It had been a great day. Thanks once again England, you turned on a pearler for us. You sparkled in all your finest today. I already loved you but I loved you a little bit more today. Thanks for the gorgeous scenery. Thanks for the glorious weather. Thanks for the charming people. Just thanks. Thanks a million. I’m going to finish on another literary note, but not my feeble attempts this time. While we were waiting to begin our walking tour, we had a look around the Shipwreck Museum, which was a small, but fantastic little place, full of artefacts, displays and information about shipwrecks that had occurred along the coast. One particular wreck and its story particularly struck me and I found particularly sad. In 1805, the Earl of Abergavenny hit rocks off the Dorset coast and was grounded. The captain was John Wordsworth, William Wordsworth the poet’s brother. When she became stranded, signal guns were fired but local vessels were unable to reach her. She began to float again, but was badly damaged and Captain John Wordsworth made a desperate attempt to sail her to Weymouth Beach, but at 11:00pm, she sank in Weymouth Bay. Even though she was only 1.9 miles from the beach, the freezing water claimed the lives of 271 passengers and crew, including Captain Wordsworth. There were some survivors and 141 people were rescued, clinging to the parts of the ship that remained above water. After this tragedy, William Wordsworth wrote a poem about the event and his brother. I found it really moving. So to end this post, I give you not my poor literary attempts, but rather a poem from a Master. Here is part of the poem by William Wordsworth titled John Wordsworth. The sheep-boy whistled loud and lo! When safety was so near. Was nothing but a name. What a great day that must have been. Sunshine, great food and lots of quaint things to look at and to listen to. The photo of the township from the top is wonderful. Did you wander around singing Abergavenny, from the 60s? The poem is so sad! I don’t know the song Abergavenny but I just looked it up and played it. A catchy tune! I did lots of involuntary head bobbing side to side!